Now the DOT, the Department Of Transportation, is the federal agency responsible for the enforcement of the laws governing the commercial trucking industry. The laws are written and enforced as federal laws but in an odd sort of system, the states are in control of their own DOT law enforcement and are free to write their own laws or increase the standards for the enforcement of the federal laws. In other words, the states can take a federal law and make it even more strict if they so choose. So some states are far more vigilant than others. Also, like with any other system of laws and law enforcement, the enforcement agency can selectively choose what laws to enforce and when and where they would like to enforce them. They can be as harsh or as lenient as they would like to be. Now if you're familiar with the way any law enforcement agency works, they try to strike a balance between allowing people their right to life, liberty, and the pursuit of happiness by not invading people's privacy and yet at the same time they must keep a leash on troublemakers and maintain control and awareness of the situation. They would like to be able to leave individual drivers and the companies they work for alone, but the reality is that they are responsible for protecting the drivers, the trucking companies, the general public, and the nation and the economy as a whole. Part of being able to maintain control means the law enforcement agency must be able to take control of any individual or entity, like a driver or a corporation, whenever they feel it is in their best interest to do so. It's no different for a parent running their own household. As a parent, you write and enforce the rules. As a child gets older they would like more privacy, their own space. Their room. Well, how can you give them their privacy yet at the same time control the household and make sure the child isn't going to do harm to themselves or anyone else? Well, in all reality you can't do both at the same time. So you set commonly accepted privacy rules like knocking on their door before entering and staying out of their room and their stuff when they're not around BUUUUUUUT if you feel it's necessary for the good of the child, the household, or to prevent any kind of harm in general you WILL pull rank and barge into their room and rummage through their stuff anyway. You have to...you're responsible and life just isn't that black and white sometimes. There are the ideals and then there are the realities. The DOT works the same way. They would like to be able to leave individual drivers and the companies they work for alone, but the reality is that they are responsible for protecting the drivers, the trucking companies, the general public, and the nation and the economy as a whole. Sooooooo, since they aren't “allowed” to invade your privacy unless a law has been broken or they have a reasonable suspicion, there are times when they will suspect that a person or entity may intentionally or unintentionally be about to cause harm and they need to isolate the cause of that potential harm before any actual harm has been done. If you think that the DOT won't be able to touch you as long as your truck appears to be safe, you are minding your own business, and your logbook is legal, you are sadly mistaken. 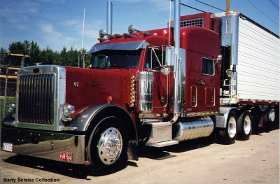 As a commercial driver you fall under federal regulation. If you ever for a moment believe they can't shut you down and take your license away for no apparent reason then you are tragically idealistic. As a truck driver you will be under the constant scrutiny of not only your own company but your own government.